When playing a video, in the server dashboard you will see one of three ways it is being played/transported. 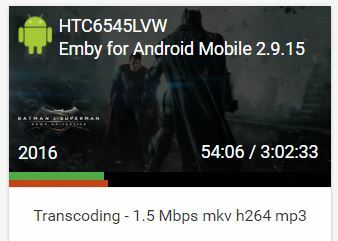 This is when the player/client (Theater, Roku, Fire stick etc) supports the container (MKV, AVI, MP4 etc), the codecs (h264, h265, XVID, TrueHD, DTS etc), has direct access to the file and has enough network bandwidth to stream it. This will mean that the server has nothing to do but tell the player where the file is and the player does the rest. The red bar indicates how much of the file has been converted and the green bar indicates your present position in the video. The container isn't supported by the player (MKV, AVI, MP4 etc). In this case, the server will demux the file and remux it in a supported container, with no change to the audio or video. The player does not have direct access to the file and the server has to 'serve' it over http, to give the player access. In this case, nothing is changed if the player supports the file properties. Your network doesn't have enough bandwidth to stream the file. This often occurs when using a mobile device on the mobile network. An example would be if your movie has a bitrate of 10 Mb/s but your internet connection has less than that. The server will run an initial bandwidth check and then transcode the file to a bitrate that will be supported. The player doesn't support the video codec (h264, h265, XVID etc). The server will then transcode it to a supported codec. Please note that the items in parenthesis, eg. (h264, h265), are just examples and doesn't mean that they are not supported. Edited by Doofus, 25 April 2018 - 03:32 PM. Your examples of Direct Streaming and Transcoding are basically the same. You are correct in that they are converting different things for different reasons, but at the very least that are Transcoding or Transcoded Streaming. Not saying you are wrong, but it is the description in the dashboard that is wrong. But, if we use the term "transcoding" when absolutely any modification is happening then it becomes not very useful at all. The reality is that the only conversion that really has much of an impact on server resources is the video stream. But, whenever some of you guys see the term "transcoding" you freak out - even if everything is working fabulously. So, we need to come up with terms that relay useful information to the end user without causing people to think something is wrong when it isn't. Transcoding is transcoding, whether it is the audio only, or both audio and video. Emby needs to be honest with its users instead of pandering to potential Plex users. Direct Play is direct from the source. Direct Stream is a stream via the server, although there is no conversion. Everything else is a form of transcoded stream. I know some apps have "Stats for Nerds", but that might confuse people more. No "transcoding is not transcoding". Converting just an audio stream has a vastly different implication than converting a video stream. We need to convey useful information to the user and we need to exist in a competitive marketplace or none of this matters - because we won't exist. I think you're too worried about the effect on the server. It's true that an audio conversion is a lot less CPU intensive than a full video & audio conversion, but transcoding is transcoding. Well using Direct Stream for remuxed audio is still not correct. Yes, Plex have a lot more users and that's who you are trying to attract, but IMHO, Emby is far superior in many ways to Plex. The file is either played as is, or it's modified in some way. Transcode - Modified in some way. Doesn't matter the degree. What I'd like to see is the transcode intensity translated in color for the playback/buffering bar. I reckon, the red is what makes people worried about Transcode. The red color == bad for my CPU. Color could easily change that perspective. This encapsulate all forms of playback, in a simple way that is understandable even to a 5 year old. You really don't need a new term "Direct stream" that makes everyone lose their mind. If you say direct stream and you include all light modification, then what does "Direct" stand for? It's smarter to classify playback with played as is or modified. Not, played as is, lightly modified, modified. Edited by Angelblue05, 03 July 2017 - 07:12 PM. Are the FAQs forum restricted in who can post? Seems only developers, mods and Admins can post. How/where was this thread originally created? Looks like it as I tested with a user account and wasn't able to reply. I actually moved it from General/Windows as it is more appropriate under Knowledge Base. But it looks like the Knowledge Base section is locked down so if this is going to be a discussion on these terms it will need to be relocated to an area the public can respond to. Well it's now more of a discussion than an FAQ, so perhaps move it back. Once we get the correct definitions set up in Emby then we can revisit it as an FAQ. 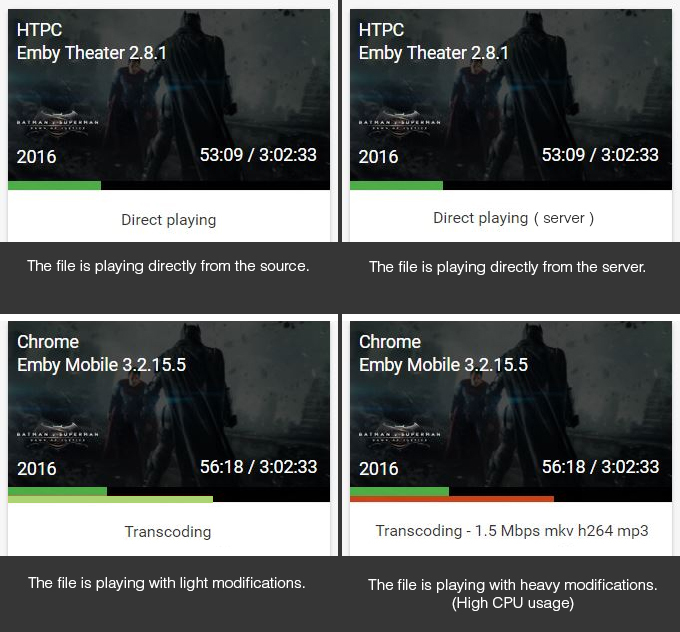 The problem is no one will pay attention to the different colors or know what they mean and with the single word "Transcoding" there, some people will freak out and post out here that Plex is "Direct Streaming" the same item that Emby is transcoding when they are actually doing the exact same thing. I think we need to just provide a bit more detail that shows the audio and video treatment separately (e.g. Direct Video / Convert Audio). Here's a thought. What about putting something in the player overlay? To specify what is occurring. Like "Transcoding Audio" etc. Some clients do this, wish others would. That way I wouldn't have to walk from my TV all the way to my server to see what is happening. Yes, the team and selected group can create thread on the K B forums section. Some thread been moved from general/supports forums to that section by the team. This how we setup things from the start, nothing change here. Combine these ideas and you have full transparency into what's happening with the playback. Show different colored bars, but also be succinct in the textual overlay as to whether it's audio, video, or both that are being modified for the client. I think they would pay attention. I know I only pay attention when I see red that is, which in my example is truly worst case scenario. Everything else is just "nice to know" info. If everything works, you shouldn't worry. If you want to optimize, then it's easy to do without checking your logs. Please answer this @ebr : What does "Direct" stand for in direct stream? It's near impossible to understand the term direct stream. 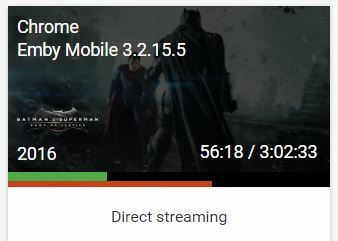 Direct stream, to me, means playing the file as-is via a stream. The term "direct" stream is even more meaningless if you include light modifications. In fact, it makes it anything but direct. You guys have the last word, but you are better than Plex, therefore don't let them limit you. Speaking as a user: We just want to be given the right information, in a quick way that's simple to understand. 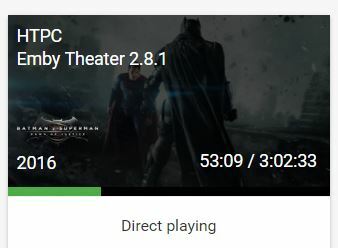 Direct stream is not informative because it could easily be direct playing from the server OR transcoding the file lightly that has almost no effect on the CPU. Edited by Angelblue05, 04 July 2017 - 12:00 AM. Direct Streaming via the server, is just creation of an http stream of the original, so that the end client app can play it back, as the client app can't access the file directly. So technically, it's not Direct at all, other than from the server, so perhaps another term is required. Edit: Anyway. I just don't want to spend time explaining this, so I'm against using a new term. I think we can make this work without it. Edited by Angelblue05, 04 July 2017 - 04:10 AM.